* Listed MSRP price is Argo's suggested price and does not include our dealer discount, rebates or inbound freight of $900. Request a quote for our best deal shipped to your door. For 2019 the hard working Avenger 8x8 ST returns renamed as the Avenger 800 8x8 and is Argos best selling liquid-cooled model. 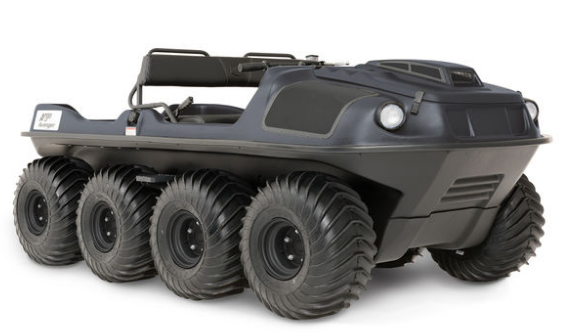 This is the ultimate off-road amphibious atv for those who don’t like a compromise when you're 40 miles from the nearest person. The Avenger 8x8 has it all, from its powerful 30hp liquid cooled gas engine which provides excellent power in the deepest mud or snow, to the efficient Admiral triple differential transmission in 6.2 or high torque 8.1 gear ratios that allow the vehicle to turn effortlessly even with tracks installed. Argo designed 25x12-9 (635 mm) mud and swim tires mounted on 9" offset steel rims combine to give this machine great traction and best in class payload all while providing a water speed of 3.0 mph. Standard equipment includes a bilge pump, full-length skid plate, and front and rear bearing extensions. The Avenger 8x8 ST is equally well suited for hard work as it is for play providing many commercial and government customers a workhorse in their fleet, yet it's refined and comfortable for all of your recreational needs. Color choices are Black or Tundra Green. Durable 1.375" extreme duty steel forged axles mounted on off-set steel rims allow for a quick and reliable conversion to running tracks. Gone are the days of adding wheel spacers and lug extenders. All you need to do is turn the rim around, reinstall the lug nuts and slide the tracks on. This new design greatly improves durability and reduces installation time. The Avenger 800 8x8 is powered by a 4-stroke OHV V-Twin liquid cooled 748cc, 30 hp (22 kW) Kohler Aegis ELH 775 engine with electronic fuel injection. It has a load capacity of up to 1070 lb. / 485 kg on land or 920 lb. / 417 kg on water, can transport 6 passengers on land, 4 on water and features a towing capacity of 1800 lb. / 816 kg. 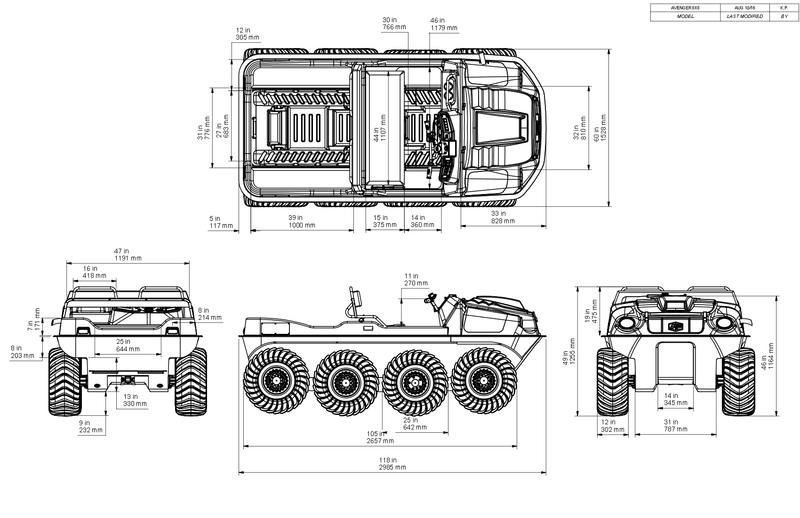 The Avenger 800 8x8 is available in tracked or non-tracked configurations. This model does not meet California CARB emission standards and cannot be sold or shipped to California.